Agnelo Gustavo Adolfo de Souza, S.F.X. ( 21 January 1869 – 20 November 1927), was a Roman Catholic priest of the Society of the Missionaries of St. Francis Xavier, Pilar who performed missionary work in the province of Goa, then part of Portuguese India. The cause for his canonization has been accepted for investigation by the Holy See, and has progressed to the point that he has been declared Venerable. The Venerable Father Agnelo Gustavo Adolfo de Souza, S.F.X. 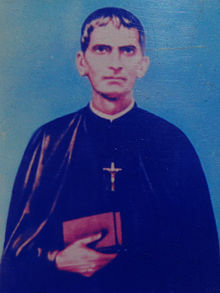 The then Archbishop of Goa e Damão and Patriarch of the East Indies Dom Mateus de Oliveira Xavier, appointed Agnel as the Spiritual Director of the Patriarchal Seminary of Rachol on 20 May 1918. Agnel died on the feast of the Sacred Heart of Jesus, which was on 20 November in 1927. He collapsed on the pulpit towards the end of the sermon. He insisted on waiting till the Benediction of the Sacred Heart of Jesus. He died and was buried in Rachol. The parish priest who buried him roughly said these words Hanvem atanch eka Santak matiek laila, which means I have just laid a saint to rest. His remains were brought to Pilar on 10 January 1939. The process of canonization was begun by the Society with the permission of the Patriarch of Goa in 1947. The second process was presented to the Sacred Congregation of Rites on 5 October 1959. The Sacred Congregation of Rites approved the third process of "De non-cultu" on 27 May 1969. Padre Agnelo was declared venerable by the Vatican on 10 November 1986. A 'feast day' is granted only to the beatified or canonized persons. As Agnelo is not yet beatified or canonized like Joseph Vaz or Saint Francis Xavier, he does not have a feast day. Fr. Agnelo was made a Venerable in 1986, and requires a first-class miracle to be beatified. The vice-postulator for his cause is Fr. Hilario Fernandes. Venerable Fr. Agnelo's day is celebrated on 20 November every year, with novenas beginning on 10 November. He is said to have wanted to die on this feast, and God granted his wish. A 'feast day' is granted only to the beatified or canonized persons. As Venerable Fr. Agnelo is not yet beatified or canonized like Blessed Joseph Vaz or Francis Xavier, he does not have a feast day. Agnelo was made a Venerable in 1986, and requires a first-class miracle to be beatified. The hymn Padr Agnel, amchea ixtta (Father Agnel, our friend) was written in his honor, besides Padr Agnelak, Altaracho Man and several others. A road in Panaji, Goa is named as Father Agnel Road. A road in Gogol, Margao is also named in his honour. ^  Archived 25 April 2012 at the Wayback Machine, retrieved 19-11-2011. ^ a b "Archived copy". Archived from the original on 4 March 2016. Retrieved 2013-02-15. CS1 maint: Archived copy as title (link), para 20_line 1 and para 29. ^ "They too are on the Way...."[permanent dead link], Indian Currents, 06-12 October 2008, p.41, retrieved 18-09-2009. ^ Gaionancho Jhelo, ank U-16, pan 239. (Konkani Book of Hymns named "Gaionancho Jhelo" Hymn no. U-16, page 239). A website with some more information. , a website with a lot more information, and many important links.